saddlebred riders united youth group. This is our own youth group that has affiliations with the American Saddlebred Horse Association and fosters goodwill with our youth riders at the barn and nearby community. 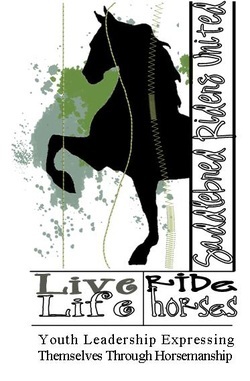 Riders will meet 1-2 times per month for fun activities, horseback rides and community service projects. This gives our youth members who ride at the barn an opportunity to mix and mingle with other youths who ride and have the similar interests. Saturday, September 26th at 3:30....we will be cleaning tack and preparing for the Testing Night. Those of you who would like to test out for Beginner, Advanced Beginner and Intermediate can do so at this time. Testing fee is $40.00 per test, $20.00 for additional test. Call today to reserve your horse for the testing. Pizza and treats will be served, as well as a demonstration from one of our trainers. This will be a fun night for all!